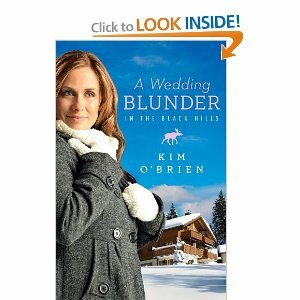 A Wedding Blunder in the Black Hills is a Christian fiction novel by Kim O'Brien. The story centers around Millie Hogan who dreams of a life on a reality television cooking show, and David Denvers the town dentist. Millie helps her mother run the Dosie Dough Cafe, her mother "helps" run Millie's love life. David's mother work at the front desk of his office, and David works at avoiding the advances of an amorous patient. Throw in some meddling aunts, a town where everyone knows everyone's business, and an almost-teenage-son and you get two people who need quick solutions. That solution? A fake relationship. This would get Millie's mother to stop setting up dates, and would get Cynthia to back off David. No one gets hurt. No one gets nagged. Everything goes according to plan, until they start to care. Now what? This was a good story. Classic two people have problems, they find a mutual solution, all goes according to plan, they begin to care... Nothing wrong with a classic plot line. It was well done. The last few chapters I found to be really well done. With a laugh thrown in at the end. I have trouble with cooks where the Christian aspect, or conversion of a main character is overdone. That was not the case with this book. I thought the christian aspects of the book were woven well with the rest of the story. Overall this is a good story, that I would recommend.